Medical Fridges. Pharmacy Fridges. Laboratory Fridges. 3 models available with various configurations to suit any need! 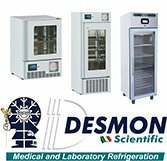 From pharmaceutical and medicine fridges to fridges for any laboratory! Upright and Under Counter Refrigerators for Laboratories and Pharmacies. The most secure environment for your valuable vaccines, reagents, pharmaceuticals and samples. Acoustic and visual alarms. LED Lighting. Stainless steel interior. Glass door with door lock. Remote monitoring capability. The PERFECT refrigerator for a pharmacy! Warranty: 2 years parts & labour. Extended warranty options available.